Today’s topic is something you’ve probably heard a little bit about but maybe you’re not too sure how to go about it or what it even really means. It’s a simple concept that can have a profound impact on our relationships, businesses… our entire lives! Living an intentional life. Not one by default. Not one that happens to you. A life that you design. Sounds pretty great, right? Join me as I share how retraining our minds to live in the present moment as excited and as passionate as we want to be can transform our days, weeks, months, and years to a life lived on purpose. It still takes active work and consciousness but once you’re aware of it, you can live a life like nobody else. What it means to live your life intentionally. How being in touch with what we create allows us to experience things at a whole new level. Why you need to hijack your mind’s default in order to live with intention. A little homework assignment to get you started! Hello, how are you guys? I hope everyone is having a beautiful day; I know I am, or at least I hope I am when this comes out. Or, should I say, I decided I am when this comes out. And I hope you guys had a wonderful Thanksgiving last week. I love Thanksgiving. Like, I’m already drooling about the food I’m going to be eating tomorrow. Although, when you guys hear this, it will be a week since Thanksgiving. But I love Thanksgiving food. Like, some of my favorite foods are from Thanksgiving; for example, sweet potato casserole or my Grandma’s infamous pumpkin dessert. I’m telling you guys, that stuff is no joke. Like, I dream about it all year. And what I really love about it, actually, is my Grandma is no longer with us. I think we lost her like four or five years ago. But she always made this pumpkin dessert that blew everyone’s minds. And it’s so fun because I stay here with my fiancé, Chris, for Thanksgiving and I actually get to cook it now and my mom also makes it at home. But it’s just something that whenever I make it or whenever I eat it, I think about her and I think – I don’t know, it just reminds me of her. It was her thing. It was something we all looked forward to, so it’s just kind of fun that something like that lives on and something so simple that you would probably have never knew her pumpkin dessert would be, like, infamous, and that every time we cook it we would think of her. So I just think that’s really cool. But today, that kind of leads me into what I wanted to talk about today, which is being intentional. It’s something that I think gets talked about a little bit and it’s something that I think is super important for all of us to live the life of our dreams. And it’s something that is so simple but yet can make such a profound impact on our lives, our businesses, our relationships; I mean, I’m talking everything. So I’m going to give you guys an example of where this showed up for me and how you can be more intentional in your life and create that in your life. 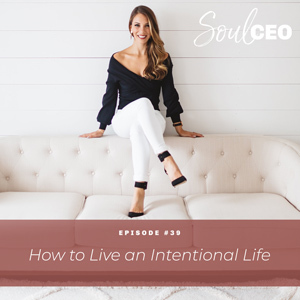 Because, when you live an intentional life, you are living your life on purpose, by design, not based on default, not based on just life happening to you and not based on being in, like, fast forward mode all day long and actually experiencing the life that you are living. Because, if you think about it, every day is a gift and we can choose to experience it that way or we can choose to experience it like just another day in the grind and the hustle and bustle and just trying to count on the days until the weekend or the next holiday or whatever it is. And while we’re doing that, our life is happening and our life is passing us by. So where this came up for me was I am kind of revamping things. I’m really excited. I’m hoping that by the time this comes out that everything is clear as day. It’s really ironic because I just did a couple of podcasts on confusion and I have been feeling the most confusion I have ever felt in my whole business in the past week. But anyway, that’s not what we’re talking about today, but I get stuck there too. But anyway, where this came up was, I was kind of evaluating the amazing programs I’ve created and just looking back at how I’ve gotten here in my life and business and making sure I’m digging deep into the thinking that has created it. And some of the things that I want to make sure that I teach my clients, that I teach people in my Mango Magic Business Academy and that I make sure I carry forward and give to the people who want to take their life and business to the next level. And in doing so, I came up with some really brilliant ideas, which I can’t wait to see how they manifest and what I create from them. But what I realized is that I had already built in a lot of that stuff into my Mango Magic Business Academy program. And that is a program that I teach something new every week and we have different modules and different sections. And the first round of it, everybody’s, like, learning in real time. I’m doing the videos and I’m teaching them, but every future round of it, they actually get a login and they get access to these videos. So that’s just a lot of extra information you guys don’t really need to know, but I realized that I prep for those calls every week. I get on, I teach, the women are getting insane transformations and getting amazing results. But what I realized is that even though I prep for them, I don’t intentionally connect back to the power of what I’m teaching them all the time. Like, I know it’s amazing, but I don’t go into it, like, when I prepare for the call or I prepare for the video. I haven’t been sitting down and really soaking in how this work – that specific call or what I’m focusing on – impacted my world and the ripple effect it created. Because I was like, holy crap, this stuff is so good – when I was doing the reevaluation, I’m like, wait, I already teach some of that. And what I realized in that moment was that I wasn’t connecting back to the power of it after the fact. When I first created it, it felt like the most brilliant idea in the world. And it still felt super impactful, but I wasn’t intentionally taking a second to really think about the impact that it had had in my business and in my life. And by doing so, I was able to see how powerful it was. And that creates a totally different energy. So that’s kind of a long story, but basically, it got me thinking on how being more intentional with every single piece of our lives and the work that we do and the businesses that we have and the way we show up to our workouts, our relationships, and all of these things, we could experience them at a whole different level. Like, I want you guys to imagine the first time you came up with the most brilliant idea ever. Maybe it’s your business. Or I want you to think about the first date you went on with the person you’re spending your life with or your husband or fiancé or whoever it is. I want you to think about the first day you started your dream job; what that felt like to you guys. Can you almost feel that? Talking about it, I can feel the energy running through my body. I can just feel the excitement. My heart just feels open and like it’s about to burst. And I remember that feeling so clearly. And the reality is that that feeling came from our mind; from our mind being like, oh my gosh, this is the opportunity of a lifetime. And actually, I’m going to get into that on next week’s podcast. Or, like, oh my gosh, I’m so excited. We showed up to our new job with curiosity, with excitement, with hope, and that all came from our mind. But then what happens is, our mind does its job, which is readjusts to whatever the new normal is. And by doing so, it’s just trying to be efficient, but by doing so, we don’t experience the things that we once experienced at a high level the same way anymore. So I was actually talking to one of my masterminds about this today and that we could experience our job like the first day we started it. We could experience our business like the first day we had the idea for it or our first client that we ever signed, or every single client that we signed. We could experience it with the excitement that we had when we signed them, or we could experience our significant other like the day we met them. And we don’t, just because our mind does its job, which is it wants to be efficient. It doesn’t want to spend mental energy paying attention to new things and being curious and working all the time, so it adjusts. But if you take back control over your mind, you can experience these things the same way all the time. And I want you guys to imagine what your life would be like if you experienced it like that all the time. Like, think about how mind-blowing and insane that would be. But you literally have to – I always joke with my fiancé, Chris, that we teach people how to hijack our minds. We have to hijack the way that it tries to operate to keep us safe, to work efficiently, to live an amazing life, which is so amazing and so beautiful. And once you’re aware of it, it still takes active work and consciousness, but you can live a life like nobody else. You can live your life in a way that nobody else gets to experience their life, which is so amazing and beautiful because you guys only get one life, and you get to live it the way you want to and you get to decide what that looks like. So what I want to challenge you guys to do – I know Thanksgiving brings up a day where people are extra grateful and extra thankful and the holidays really do that for us as well. But I want you guys to challenge yourself to be intentional about every single day; to maybe take five minutes before you go into your day and think about how you want to experience the day, how you want to experience your significant other, how you want to experience your business, how you can feel the way you did the first time something happened on the 50th time it happened. And that is going to build memories. That’s going to build a connection to what you’re doing throughout your day every single day. And that’s going to build a life that you will remember, that you will love, that you feel like you intentionally lived and experienced, not just let it happen to you. So that is what I want you guys to do. I’m giving you homework. I think I do that a lot. And I’m thinking about actually sending out emails with some homework in the future. We shall see where that goes. But I want you to write your five intentions for the day. Do you want to experience love? Do you want to experience openness? Do you want to experience excitement? And then look for where you have the potential to experience that and going into your day actively working to create that. That will create an intentional life and that will create a life worth living; full of joy and excitement. And I know life isn’t always perfect and every day isn’t always great, but I think that’s a part of the human experience; still being intentional about living it fully and deeply and widely. And that’s what I want to teach you guys to do here. So I love you guys. I’m so excited you’re here. And I love, love, love it when you guys share my podcast on your Instagram stories and I really try to respond and interact and engage with all of you and share your content, your Instagram story on my Instagram story. So keep doing that. I love it so much. I love sharing this information with as many people as humanly possible and I hope you guys have a beautiful day and I will talk to you next week, bye.